Port of Baltimore acquisition helps mobilize for what’s on the horizon. The Port of Baltimore has seen a significant jump in its container business. MPA recently purchased property located behind the Seagirt Marine Terminal. Supersized container ships traveling through the newly expanded Panama Canal have been arriving at the Helen Delich Bentley Port of Baltimore since last year and the Maryland Department of Transportation’s Maryland Port Administration (MDOT MPA) continues to make plans to handle the increased amounts of containerized cargo. Recently, the MDOT MPA purchased property at the Point Breeze Business Center, which is located right behind the Seagirt Marine Terminal. The 70 acres of MDOT MPA land will be used for additional cargo opportunities including containerized cargo. This represents the first new land purchase for cargo opportunities by the MDOT MPA since 1987 when land was purchased at the Fairfield Marine Terminal for autos. The MDOT MPA plans to utilize the additional land as a container storage location but can also use it for autos and roll on/roll off storage. About 1,650 direct jobs are expected to be generated due to this purchase. In 2016, the port handled a record 538,567 containers. Since July 2016, when the port welcomed its first large container ship through the Panama Canal, containers are up seven percent. The Seagirt Marine Terminal, the Port of Baltimore’s primary container facility operated under a public-private partnership with Ports America Chesapeake, includes 11 cranes, four of which are neopanamax, the largest cranes in the world. The Port of Baltimore is one of only four US east coast ports currently capable of handling some of the largest ships in the world. 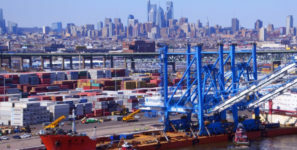 Combining both the public and private marine terminals, the Port of Baltimore saw 31.8 million tons of international cargo cross its docks last year which was valued at approximately $49.9 billion. Baltimore is ranked as the top port among all US ports for handling autos and light trucks, farm and construction machinery, imported gypsum, imported sugar, and imported aluminum. Overall Baltimore is ranked ninth for the total dollar value of cargo and 14th for cargo tonnage for all U.S. ports. Business at the Port of Baltimore generates about 13,650 direct jobs, while about 127,600 jobs in Maryland are linked to port activities. The port is responsible for nearly $3 billion in personal wages and salary and more than $300 million in state and local tax revenues.